If we think about the PhD as a process . 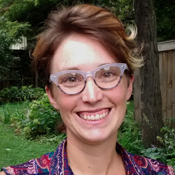 . .
Erica Damman, an artist and researcher in the UI Interdisciplinary PhD program, studies Environmental Humanities. Erica Damman’s work explores artists and creative practices that intersect with environmental questions. Erica was an Obermann Graduate Institute on Engagement and the Academy Fellow, and she also participated in the Humanities Without Walls Program. Erica Damman: The exciting part of a nontraditional PhD is for me best illustrated by a quick story, told to me some years ago. A woman was finishing her PhD and reflecting on the work she had completed as she began applying for jobs. She had, she surmised, completed over 40 dives in various locations to study a specific coral and fish relationship. With each dive, she began to understand more about the nuanced relationship between the two and the ways in which they were situated in their wider environment. Now, is she extremely knowledgeable about that specific coral and fish? No doubt she might be titled an expert in that topic. But she’s also an experienced diver. One could even say that the skills required for diving are more relevant to her future as a scholar/human inside or outside the academy. If we think about the PhD as a process, as a project for honing a skill like diving (while also sharpening skills like analysis, observation, critique, etc. ), then the nontraditional PhD for me has been an opportunity to more consciously determine what set of skills I want to cultivate. I wanted to maintain a visual arts practice that offers participatory events outside the academy and I wanted such a practice to take up contemporary issues that resonated with me, in this case human and nonhuman vulnerability in the age of climate change. To this end, I am producing three artist games, playing them with various publics, and situating them in art historical, environmental, and game play research. The most exciting aspect of this process has been the ways that my creative practice has informed my writing and vice versa. In studying theories about games and play, what better way to give my writing depth than to actually experience many of the aspects to making games? The back-end processual knowledge I’ve gained changes the way I approach, analyze, and apply theories of play and games to my project and those like mine. Doing this kind of work is not without its challenges however. Identifying a faculty committee that recognizes different sorts of scholarly output is a first order issue. And even when said committee acknowledges your creative process and attendant products as part of the dissertation, coming to an understanding of how much that process and those products count for – that is, if you research, prototype, test, and create three games, is that worth as much as, or more, or less than a chapter or two in a traditional dissertation? – is an issue that should be zealously patrolled. The continued newness of alternative dissertation projects means that the project is still compared to a 250-page monograph, and the danger is that the graduate student ends up doing an and, and project. For example, it’s great that you want to make this creative, visual work for your project but you’ll do that and you’ll complete the normal amount of written work. Other difficulties include the real work of having to be your own advocate – defending not just your project’s content or conceptual framing but the structure as well, not having a lot of people or examples to look to, and finally, balancing time for creative and written output.